Du'ã is asking Allah for help or for the fulfilment of a particular need. It expresses a slave's helplessness and dependence on Allah, the All-Powerful and Merciful. It is the channel through which one gets directly in touch with one's Creator. Just as Salãh, Sawm, Zakãh, Hajj etc. are acts of worship, du'ã too is an act of worship. Therefore just as one takes out time to pray Salãh or to recite the Qur'ãn or make zikr, similarly, according equal importance to du'ã, one should also take out sufficient time for the sake of du'ã. The objective behind every act of worship is the Recognition of Allah as the Creator and the All-Powerful, and that one acts according to His Will and not as one likes. A Servant of Allah accepts his weaknesses and recognises his need for Allah. Out of all devotions, this humbleness and total submission is best expressed in du'ã. Furthermore, other acts of worship can become a source of pride whilst du'ã is an act which is usually free from any trace of pride. Nowadays, du'ã has become a mere ritual. It has become a routine practice which one is accustomed to perform at certain times of the day. People raise their hands for a few moments at the time of du'ã, uttering a few words, some consciously, and some without even realising what they are asking for. Today hardly anybody resorts to du'ã for solutions to their problems. For most people du'ã is a devotion which is the most difficult to practise. Even at the blessed places and in the blessed moments, a short while occupied by du'ãs will seem like hours. By and large, we find that the engagement in Salãh or the recitation of the Qur'ãn is relatively easier than making du'ã. This only reflects our distance from the Being of Allah, as du'ã is the only act of worship which provides us with the opportunity to communicate with Allah in the manner we wish. Lack of concentration in this act of worship shows that the performance of other acts of worship are also customary and superficial, and lacking the true essence. If we truly enjoyed the Proximity of Allah, we would inevitably have found enjoyment in confiding in Him and beseeching Him. We would have always felt an eagerness to turn to Him, in open and in solitude. Many of us make du'ã half-heartedly, not convinced whether our demands will be answered or not. We should know that Allah always answers the du'ãs of people. However, it may not always seem so and many people, failing to experience the effects immediately, begin to feel dejected and put off. This, however, should not be the case, as Allah, the All-Hearing, undoubtedly hears and accepts the supplications of people, only that the du'ãs of some are answered immediately, whilst those of others are deferred for their own benefit. By keeping the following few points in mind concerning du'ã, inshã'allah, one will benefit greatly. Firstly one should remember that du'ã is an act of worship and should be given an independent status of its own. It should not remain a mere ritual. Secondly, one should make du'ã after performing all good deeds such as Salãh, recitation of Qur'ãn, zikr etc., and also fix a specific time especially for du'ã. In du'ã, one should adopt humility and ensure that one understands what is being asked. The time spent in du'ã should be gradually lengthened. In the initial stages, the same du'ãs can be repeated over and over, and in the meantime more and more du'ãs should be memorised. An effort should be made to learn those du'ãs in particular which encompass the general need of all the Muslims. One should ask Allah for both worldly needs and those of the Hereafter. Rasoolullah sallalahu alayhi wasallam has instructed us to ask Allah for all our needs, however petty they may seem to be. He sallalahu alayhi wasallam mentioned that even if a person's shoelaces break, he should ask Allah before embarking to obtain new ones. Finally, one should not ask for anything unlawful. Many young people do not realise this and by asking for impermissible things incur the displeasure of Allah. 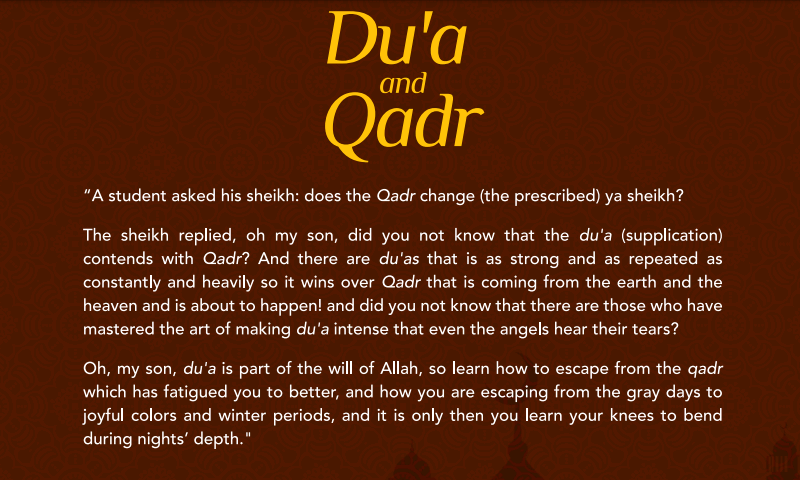 The hadeeth speaks of du‘aa being the essence of ‘ibaadat. In fact, one hadeeth states that du‘aa itself is ‘ibaadat. Apart from the various forms of ‘ibaadat that we do, we still need a way to secure the favours of Allah Ta‘ala. So this is through du‘aa. Du‘aas are always answered, they are never rejected. It is just that some du‘aas take time to materialise. It is like different seeds that you plant. Some may take one year to bear fruit and some may take ten to fifteen years. One should therefore go on begging from Allah Ta‘ala. And Allah Ta‘ala loves the tears of His servants. Therefore, at times there is a delay in the du‘aas being answered. As believers, we all have a deep yearning to attach ourselves to our Merciful and Gracious Creator. Even the sinful aspire to do something that will please their Master and bring them closer to Him. Out of His sheer Grace and Mercy, Allāh ta‘ālā has created many ways for us to acquire this closeness. One of these is du‘ā. By making du‘ā, we create a special connection with Allāh ta‘ālā whereby love for Him increases, faith in Him strengthens and the doors of boundless mercy are opened for us. If we do not ask from our Creator, we will never be able to create that special relationship. Take the example of two people, one who is poor and needy and the other who is wealthy and eager to find opportunities to assist the needy. If the poor man were never to ask the rich man for assistance, he would never develop any relationship with him. However, by asking for assistance, a degree of recognition is created. If, at every time of need, he asked the rich person for help, and the rich person gave, then this would surely create love for the rich man in the poor man’s heart. Similarly, witnessing the helplessness and neediness of the poor man, mercy would increase in the heart of the rich man, and he would regard this needy person instrumental in gaining the Pleasure of the Creator. He would advise the poor man not to be hesitant in asking him for help whenever the need arises. Soon the relationship would become such that the rich man would not wait for the poor man to ask, but would bestow his generosity upon him even before that. This is just an example of how mere mortals would behave; the Mercy and Grace of Allāh ta‘ālā are beyond imagination! 2. Make it a practice to say a short du‘ā after every good deed, whether you are in need or not. In reality we are always in need, but sometimes we get the impression that we have no needs. Our circumstances all look favourable; we are healthy, we have sufficient finances, we have security, our children are obedient, etc. The question is: Can we be sure that these circumstances will remain same? We also need to think a little deeper: is my death on Īmān guaranteed? What about the stages of the grave? How will I fare on the Day of Resurrection? In reality, we are always in need and so should always adopt the habit of making du‘ā, even for a short while, after every good deed. If we are short of time, then there are some very concise yet comprehensive supplications which we can make at such moments, e.g. 3. 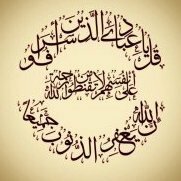 Rasūlullāh sallallāhu ‘alayhi wasallam has taught us many beautiful supplications for various occasions that are amazing in their precision, conciseness, depth of meaning and appropriateness to the occasion. Contemplating their meanings increases one’s faith and love for Rasūlullāh sallallāhu ‘alayhi wasallam. This is such a great favour of Rasūlullāh sallallāhu ‘alayhi wasallam upon us that we can never repay even if we were to spend our entire lives sending salutations upon him. Prior to my recent operation, I thought it opportune to request my akābir (elders) to make du‘ā for me. Amongst those who are especially affectionate to me is my respected Shaykh, Hadrat Mawlānā Qamaruz-zamān sāhib hafizahullāh. During our conversation, only moments before the operation, Hadrat advised me to recite one of the supplications of Rasūlullāh sallallāhu ‘alayhi wasallam that Hadrat Shāh Wasīyullāh sāhib rahimahullāh used to frequently read. O Allāh, I ask You for a pure life and a peaceful death and a return that is neither disgraceful nor dishonourable. Although, this supplication is of a general nature and not stipulated for this particular situation, however, whilst pondering over the meaning of this du‘ā, I felt as if it was especially devised for the very situation I was in. All supplications of Rasūlullāh sallallāhu ‘alayhi wasallam are priceless gems, if only we were to value them. We should learn them and make them part of our daily lives. This will also help us maintain the remembrance of Allāh ta‘ālā throughout the day. 4. There are also many supplications of Rasūlullāh sallallāhu ‘alayhi wasallam that are not specific to any occasion. Our mashāyikh have gone to great lengths to compile these in book form so that we can benefit from them. We should make it a practice to read these compilations so that we can reap their benefits in both worlds. Two famous compilations are Al-Hizb Al-A‘zam and Munājāt-e-Maqbūl. It is best if we can read both daily, otherwise at least one. If this is also difficult then at the least the abridged version of Al-Hizb Al-A‘zam should be read. Similarly, Allāh ta‘ālā granted me the tawfīq to compile those supplications in which Rasūlullāh sallallāhu ‘alayhi wasallam sought refuge from certain things. This compilation, called Al-Mu‘awwadhāt, will also bring great benefit if included in one’s daily practices. Istighfār is also a form du‘ā. I was also granted the tawfīq to compile the phrases of istighfār from the Qur’ān in a small booklet, and this will also be of great benefit as part of one’s daily practices. Let us hold fast to du‘ā. It is a priceless gift and powerful tool granted to us by Allāh ta‘ālā and we should recognise it as such. We should not regard the great gift of du‘ā as a burdensome ritual carried out without any real interest or understanding of its importance. Allah Ta’ala loves this type of sincerity where the heart is cleaned and cleared from every other thing but Allah. One has his hope in Allah Ta’ala alone. One has the conviction within his heart that the only door to get my needs fulfilled is His door. When one makes duaa in this state, then Allah Ta’ala readily answers that duaa. Islam as a perfect religion and a way of life gives us the best direction on how to invite people to Islam in the most effective way. To be successful Dua, Allah I commands us to invite people to Islam with hikmah (wisdom) and beautiful preaching. The reason for a person not feeling enthusiasm and motivation for making du’aa is that he does not immediately see the effect of his du’aa. For example, if a person makes du’aa for wealth and immediately receives some money, or he makes du’aa for an apple and it immediately falls into his lap, then due to him seeing his du’aa have an instant effect, you will see him become very enthusiastic and motivated to make du’aa. The lack of motivation to make du’aa is normally because a person feels that he will not gain or receive anything through making du’aa, and feeling in this way is a sign of being deprived. Du‘aa is a request and begging. How many of us actually make du‘aa in this manner, especially in the du‘aa after salaah. Our du‘aa is a mere repetition of words. Looking at the present conditions we are facing, I suggest that we get together as a family and make a collective du‘aa. In this way, one will be making du‘aa and the others saying aameen. The possibility of acceptance is far greater. Through this there is the benefit of feeling the presence of Allah Ta‘ala. Apart from that, you have passed on a great gift to your children; they will feel that our father has not left us as yateem (orphan). He has given us the gift of communication with Allah Ta‘ala. As a result they will feel strong and healthy and will be saved from depression.